Brooklyn usually gets a bad rap for having the best rap. It becomes cliche to say “we’re playing Brooklyn,” because, of course you are. 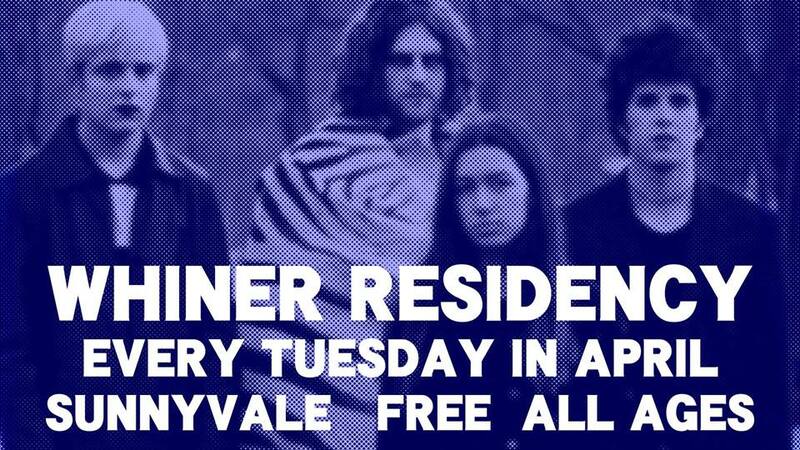 But where else are you going to get an April residency from the likes of downer-pop quartet Whiner? Every Tuesday of this month, they’ll be headlining Sunnyvale in BK, accompanied by a slew of notable acts (you’ll see ‘em listed below). And you know what? The shows are free. And it suits them just fine. The band dropped their debut LP, Forever, two Novembers ago (stream that below), and they’re currently working on their second. They play heartfelt jangled indie rock that infuses pop sensibilities and gloomy undertones with a vocal and lyrical vulnerability that can only be described as human. You find them agreeable because their songs have happened to you (and because they’re infectious as all hell).